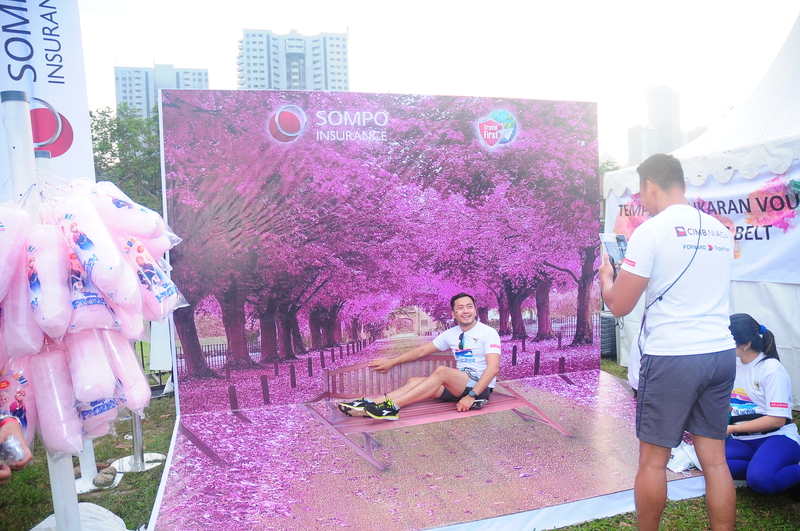 On 1st of October 2017, Sompo Indonesia was proud to be one of the co-sponsor partner for The Color Run™ event presented by CIMB NIAGA at Senayan, Jakarta.Participated with more than 10,000 people including 70 Somponers, this sponsorship form seen as an opportunity aimed to increase Sompo Indonesia’s brand awareness especially to CIMB customers and wide society. As the co-sponsor of the most awaited and well-known running event called the “Happiest 5K on The Planet”, Sompo Indonesia was delighted to wave the fifth flags off and having an opportunity to share Sompony dolls on the flag offs.We also provided a Sompo Gate on pink color zone area as well as had a booth on the festival area. To show Sompo Indonesia’s entity as a Japanese Company, Fuji Mountains and Sompony theme was adapted as the decoration for all Sompo areas.All the areas were fully loaded by high spirit, joyful, and excited participants. All the participants also enjoyed our three different themes of photo walls and temporary tattoos. Runners were excited and had the tattoos on their faces and arms.The event was seen as joyful yet colorful, and runners are looking forward for the next year’s event.